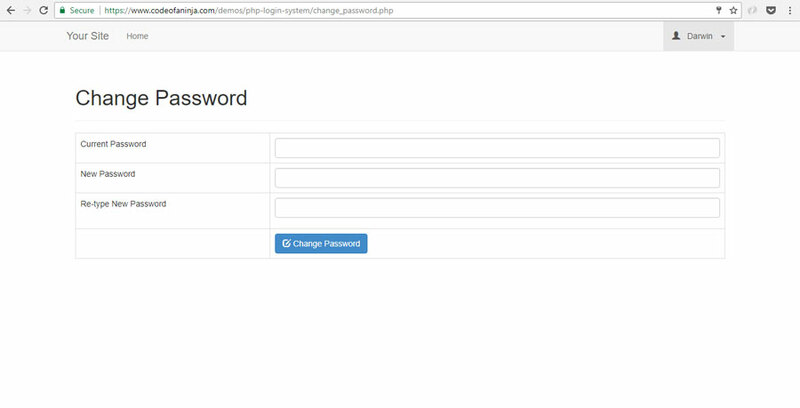 PHP Login Script with Session Tutorial – Step by Step Guide! 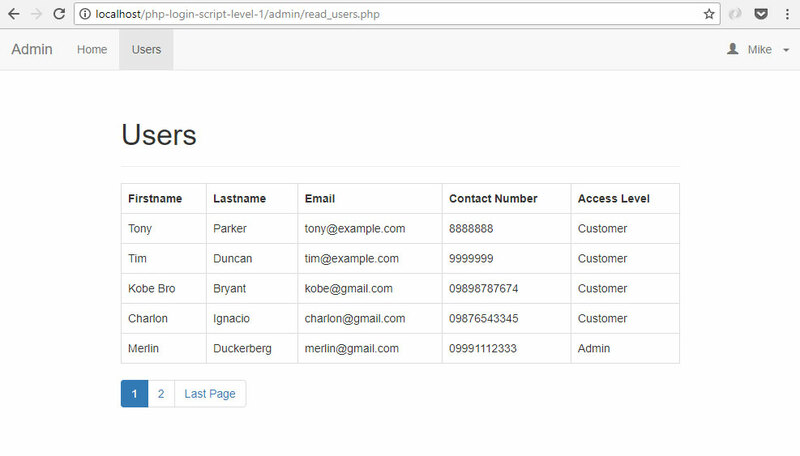 Previously, we learned how to create, read, update and delete database records on our PHP OOP CRUD tutorial. 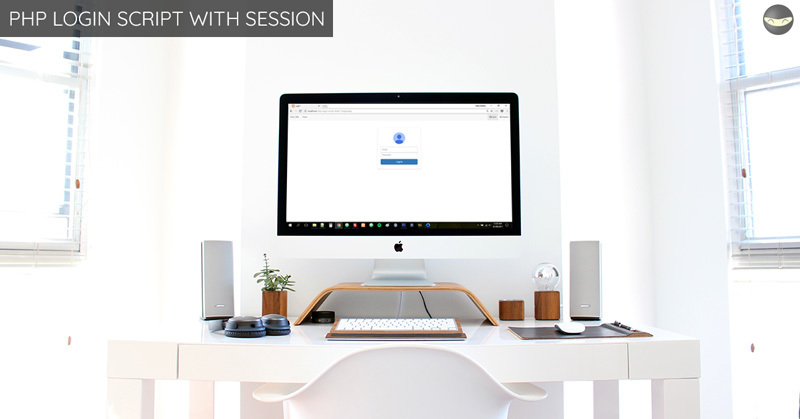 Today, we will put some of that knowledge to work by building a simple PHP login script with session. 11.0 How to validate email address? 14.0 How To Run The Source Code? Login? Logout? Sign Up or Register? We see this functionality in almost every website we use today. Facebook, GMail and Twitter are just some examples. If you want to become a web programmer, this is one of the most basic skills that you need to learn. If you haven't, today is a great day for you. We have some good news. 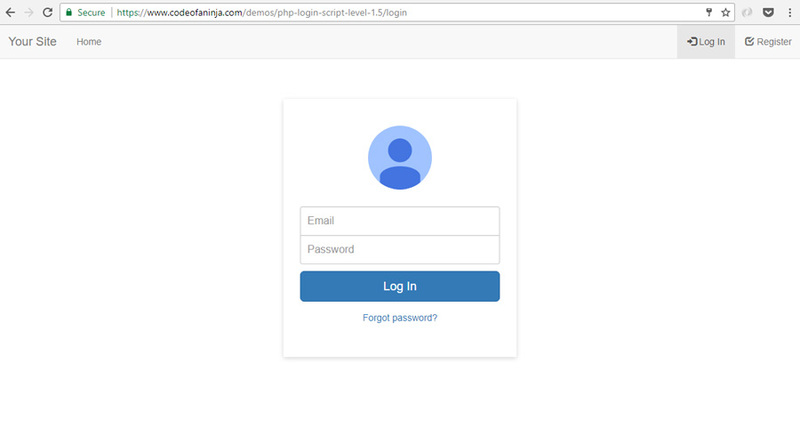 In this tutorial, we will learn how to build a simple PHP login script. This will help you create the web app of your dreams. Just like how we build ours. We will cover how to create a login form, registration form, customer section, admin section, list of registered users, logout and more. You will learn useful web programming techniques as well. At the end of this tutorial, we will have the following folders and files. You will learn the purpose of each of these files and folders as we go along the tutorial. 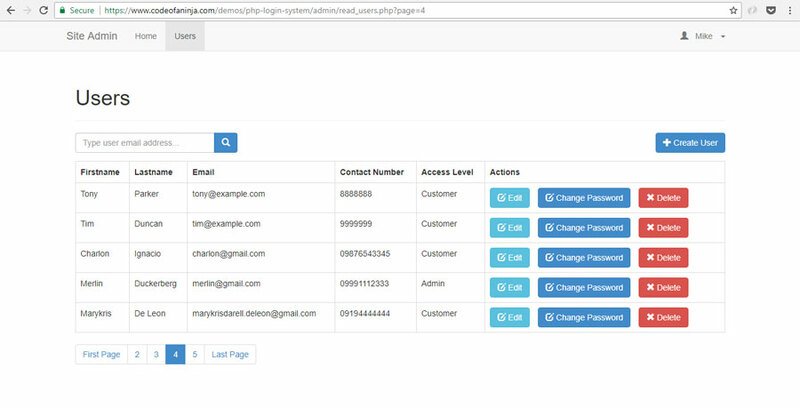 Open a new browser tab and go to PhpMyadmin. The address is http://localhost/phpmyadmin. 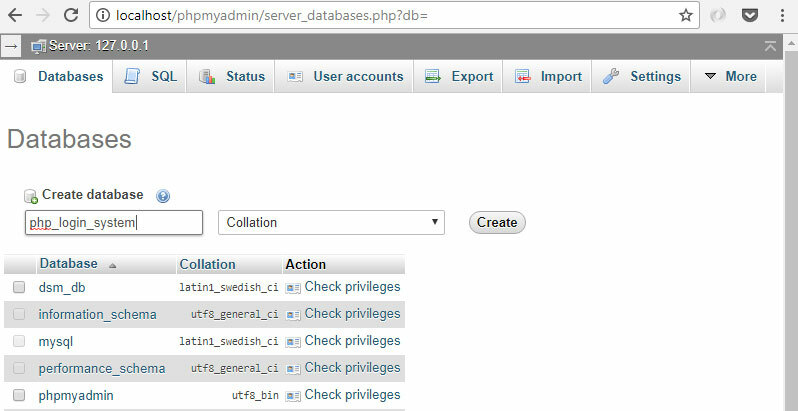 In PhpMyAdmin, click the database name. Go to SQL tab. Create the "users" table by running the following SQL statement. Go to PhpMyAdmin's SQL tab again. Insert new records to users table by running the following SQL statement. This class is used for connecting to database. I assume you are using XAMPP. Go to the root directory. In my case, it is the "C:\xampp\htdocs" directory. We will create our project's folder. Create "php-login-script-level-1" folder. Open that folder. Create "config" folder and open it. Create database.php file. Place the following code. This class is used for "user" object operations such as creating a user, deleting a user and more. We will add several methods in this class as we go along this tutorial. For now, we will just put the PHP class structure and necessary object properties. Create "objects" folder. Create "user.php" file. Place the following code. Congratulations! We just made the set up for our login script's database. We do not have an output on a webpage yet. Continue the tutorial below to achieve more output. Using a config file is great for your app. It is a central place where you can set common variables such as your apps home URL, pagination settings and more. Open "config" folder. Create "core.php" file. Place the following code. A login checker file is used by our web app to identify if a user is logged in or not. 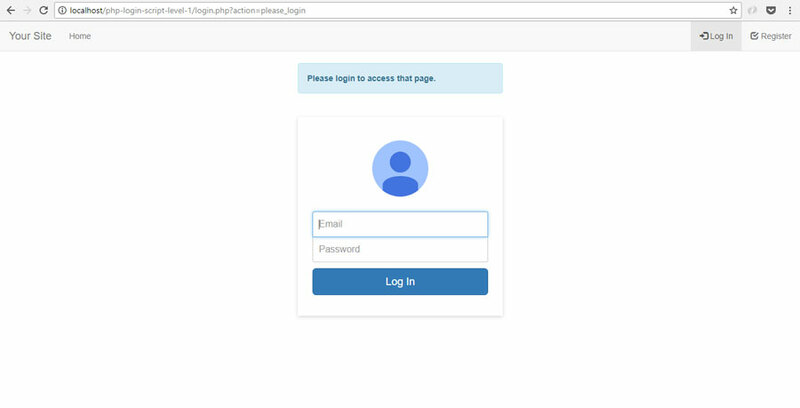 If a user is not logged in and he tries to access a page where a login is required, that user will be redirected to login page. Also, if a logged in user tries to access a login page, he will be redirected to the dashboard because he is already logged in. Back to root directory, create "login_checker.php" file. Place the following code. The .htaccess file use very useful to make URLs pretty and easy to remember. For example, page page on this URL "http://localhost/login.php" can be accessed using this URL "http://localhost/login". Create ".htaccess" file. Place the following code. # used for php pages such as "yoursite.com/login.php" will become "yoursite.com/login/"
To make .htaccess file work, make sure mod_rewrite Apache module was enabled in your server. Learn more here and here. Congratulations! 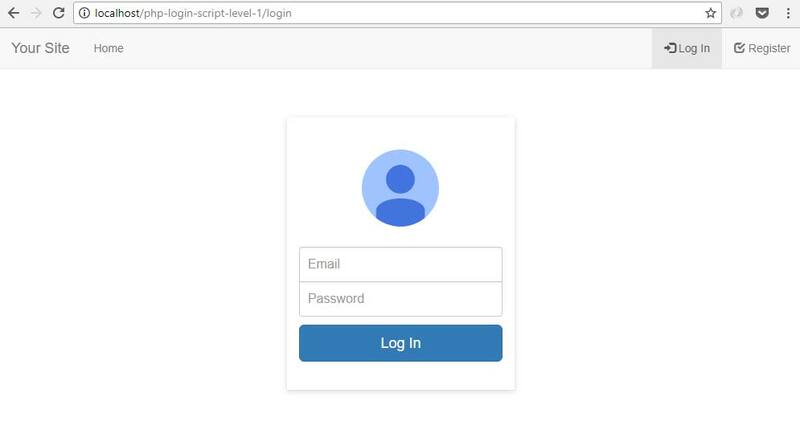 We just made the basic set up of our login script. We do not have an output on a webpage yet. Continue the tutorial below to achieve more output. Template files are very useful because it saves us a lot of time. How? When you use template files, you won't have to repeat the common codes on each web page you are working on. The examples of those common codes are the HTML tags on the 'head' and 'foot' of the web page. We will learn more about this concept as we go along this tutorial. The navigation is where the user can click the home page link, logout button and more. Create "navigation.php" file. Place the following code. If the user was logged-in, the system will show them a logout button in the navigation bar. Replace "// login and logout options will be here " of the previous section with the following code. If the user is not yet logged-in, the system will show them the login and register buttons in the navigation bar. 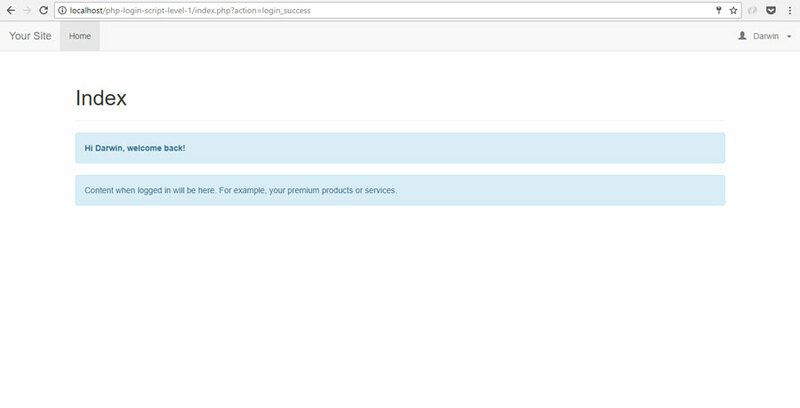 Replace "// show login and register options here " of the previous section with the following code. Our PHP pages contains almost the same HTML header code. We do not want to copy and paste the same HTML header code for different PHP files every time. What we will do is to put them in this one file. It can be used by different PHP files using PHP include_once statement. Create "layout_head.php" file. Place the following code. The same concept with the page header file above, we do not want to copy and paste the same HTML footer code for different PHP files. Create "layout_foot.php" file. Place the following code. We will customize the web page for the customer using this CSS file. You can add your own CSS here as well. Create "libs" folder. Create "css" folder. Create "customer.css" file. Place the following code. Congratulations! We just made the set up for our web pages. Our login page, register page, index page and other pages will look more beautiful now. We do not have an output on a webpage yet. Continue the tutorial below to achieve the output of our login page. This file is where the user will enter his email and password. 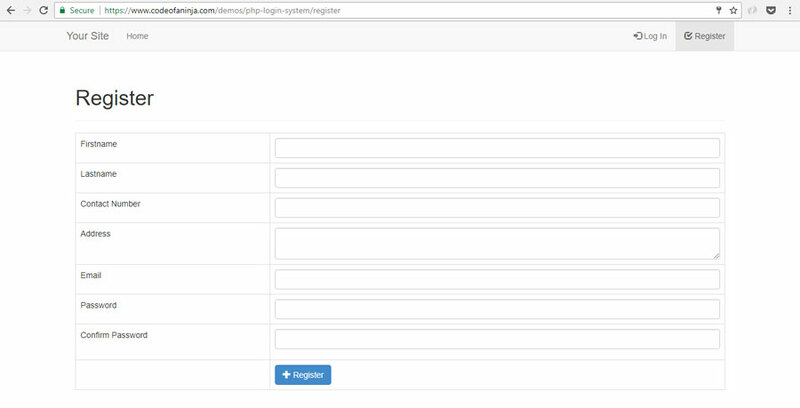 Create "login.php" file. Place the following code. 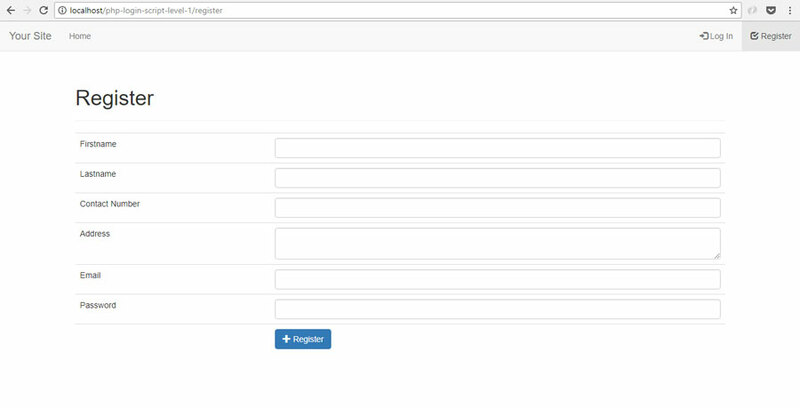 Next, we will add the actual HTML form that contains the email field, password field and login button. Replace "// login form html will be here" of the previous section with the following code. Finally! We just made our first output. Open a new tab and go to http://localhost/php-login-script-level-1/login, you should see something like the following. But our output does not work yet. Let's continue coding below. These alert messages are shown based on the given action parameter. The system action was generated as a result of the activity the user has taken. For example, the user tries to access a page where a login is required. 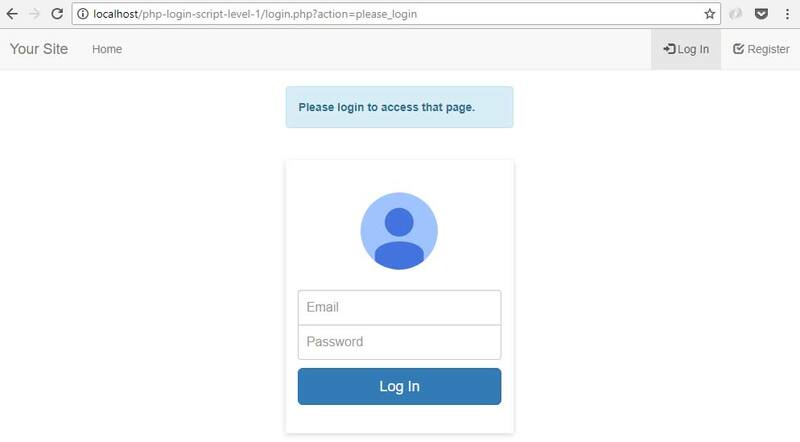 The system will generate the "please_login" action that will be used to show a "Please login to access that page." message. Replace "// alert messages will be here" of the previous section with the following code. Here's a sample output if we added the previous section's code. The alert message below were seen if the user tries to access the customer index page http://localhost/php-login-script-level-1/ without logging in. 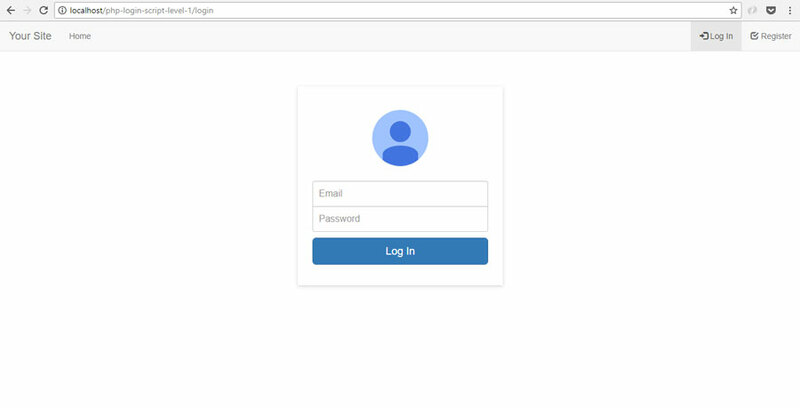 The following "if block" will execute a code when the user submitted the login form. Find "// post code will be here" in "login.php" file. Replace it with the following code. The code below will check if the submitted email address exists in the database. The $user->emailExists(); function will return true or false. Replace "// email check will be here" of the previous section with the following code. The previous section will not work without the following method inside the user class. This method will read a user record from the database based on a given email address. Open "objects" folder. Open "user.php" file. Place the following method in user class. The user will be allowed to login when $email_exists is true, the password matches and user status is equal to 1. We used the built in PHP password_verify() function to match the submitted password with the hashed password in the database. User status 1 means the user is verified. 0 means unverified. For this tutorial, we assume all users are verified. 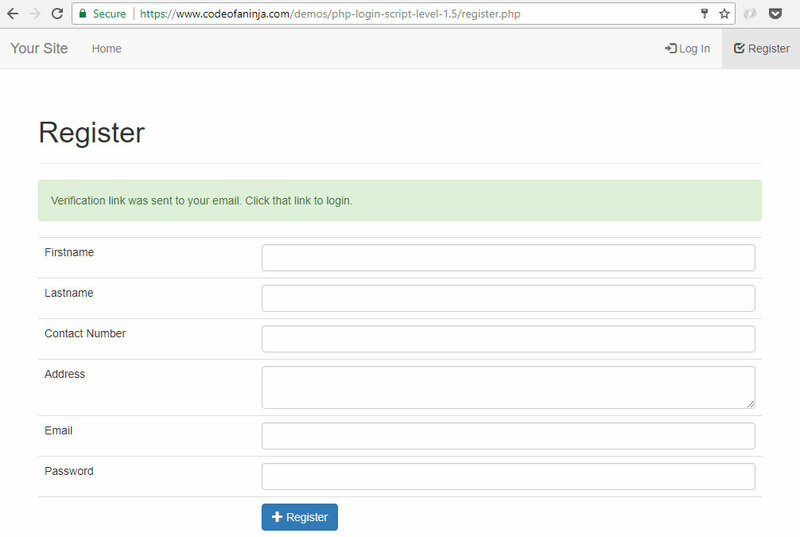 Replace "// login validation will be here" of login.php with the following code. This file is shown when the user was successfully logged in. Create "index.php" file. Place the following code. Here's how to logout the logged in user. Create "logout.php" file. Place the following code. The login form and logout should work at this point. When you try to login a customer account. Use the following login credentials. Once logged-in, you will see the following. The register page, also known as the "sign up" page, is where people will enter their information to be a registered user of the system. Create "register.php" file. Place the following code. This class is used for accessing common or general methods used by our application. This is a good practice. We will add this here so that it can be used later in this tutorial as well. Open "libs" folder. Create "php" folder and open it. Create "utils.php" file. Place the following code. 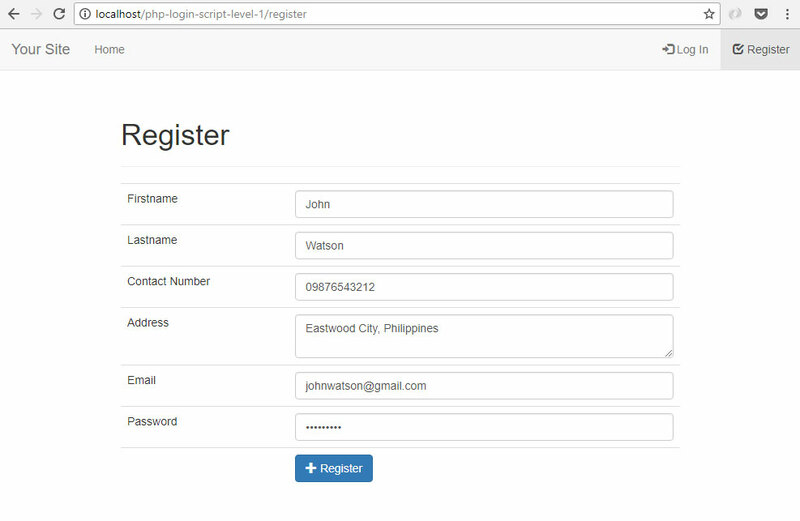 The register.php file does not have the registration form. We will place the registration form using the code below. Replace "// registration form HTML will be here" of the previous section with the following code. This is code where the system will catch the information submitted by the user. The code below will try to detect if the registration form was submitted. It also validates if the submitted email already exists or not. Replace "// code when form was submitted will be here" of the previous section with the following code. If the email does not exist, the program will create the user in the database. The code below will assign the submitted data to "user object" properties and then call the create() method. Replace the comment "// create user will be here" of the previous section with the following code. The create() method used in the previous section will not work without it in the user class. This method contains the INSERT query to the database, sanitizes the submitted data, binds the data and executes the query. Open "objects" folder. Open "user.php" file. Add the following function inside the class. The purpose of this method is to show additional details about an error. 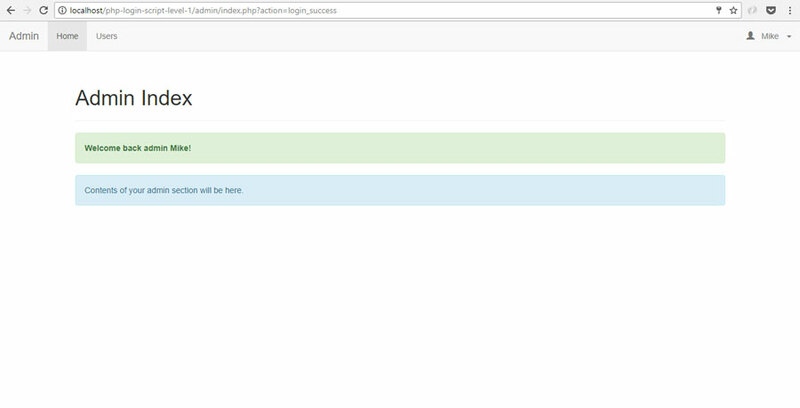 Run http://localhost/php-login-script-level-1/register, you should see an output the looks like the screenshot below. It will display appropriate alert message when the registration form was submitted. 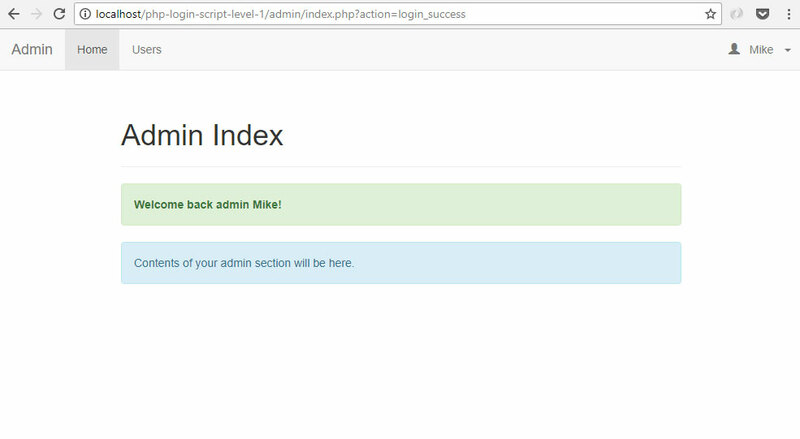 Once the an admin user successfully logged in, this admin index page is where he will land. Create "admin" folder. Create "index.php" file. Place the following code. The admin section has its own navigation bar. The reason is the admin menu can be very different from the user menu. Open "admin" folder. Create "navigation.php" file. Place the following code. This page header file is for admin section only. This is where the navigation bar of the previous section was used. Open "admin" folder. Create "layout_head.php" file. Place the following code. This page footer file is for admin section only as well. Open "admin" folder. Create "layout_foot.php" file. Place the following code. There are differences in style in the admin section as well. For this reason, we need a different custom.css file. Open "libs" folder. Open "css" folder. Create "admin.css" file. Place the following code. We choose to use a different login checker for the admin section. This is because there can be different redirects required by the admin section. Open "admin" folder. Create "login_checker.php" file. Place the following code. Use the following login credentials to login an admin account. This file will is what was accessed in the browser to show the list of registered users. Create read_users.php file. Place the following code. This method is needed by the previous section to retrieved records from the database. Open "objects" folder. Open "user.php" file. Place the following code inside the class. The HTML table is where the records are placed. We used a template file so that we can use the same layout for the search feature. Create read_users_template.php file. Place the following code. The data returned by the countAll() method is used for calculating the correct pagination buttons. This pagination file renders the clickable page buttons. It can be used for different objects as well, not just users. Create paging.php file. Place the following code. 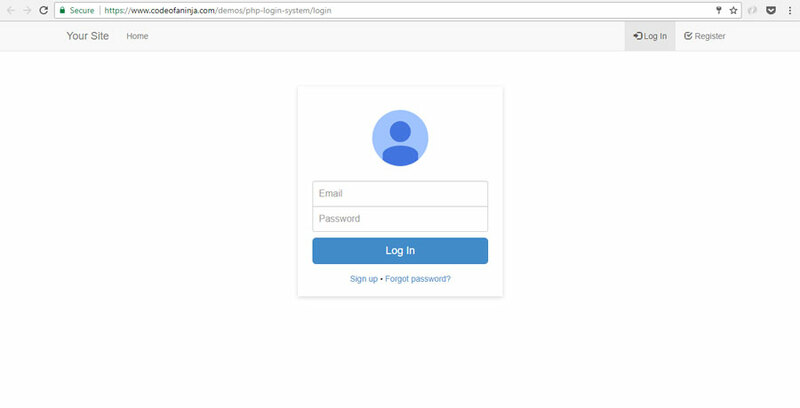 Login as admin and go to http://localhost/php-login-script-level-1/admin/read_users.php, you should see an output like the following. This is a bonus section. This feature is not part of LEVEL 1 source code. This feature needs a remote server where PHP mail function works. It does not work in localhost. If the user status is equal to 1, it means the email account is valid. Since we want the user to validate his own email address, we will make it invalid (status equals to 0) the first time he register an account to our system. Access code is a unique string of characters that is needed for email validation process. Still in register.php, place the following code under the code of the previous section. This method will generate a unique string of characters for the access code field of the previous section. Open "libs/php/utils.php" file and place the following code inside the class. Since we added a new field, we need to change the create() method in the User class. Open objects/user.php file. Replace the create() method with the new one below. And add the following code under it. Instead of just displaying "Successfully registered." message, we will send a verification link to user's email address. This means we will use a new function and message saying "Verification link was sent to your email. Click that link to login.". Open register.php file and find the following "if-else" statement. Verification link was sent to your email. Click that link to login. User was created but unable to send verification email. Please contact admin. This method will help send the email with verification link to the email address submitted by the user. It uses the built-in PHP mail() function. Open "libs/php/utils.php" file. Place the following code inside the class. Change the $from_name and $from_email variable values to your own. Try to register a new account. After submitting the form, you will see a message box like the following. Follow what the message says to validate the email address. The verification email that the user will receive looks like the following. You can always change the copy of this message using the $subject and $body variables. Once the user clicked the verification link, the system will change the status from 0 to 1. He will be redirected to the login page with a confirmation message as well. Create verify.php file in your project's main directory. Place the following code. Open "objects" folder. Open "user.php" file. Add the following method inside the class. The previous code will redirect the user to the following page. This feature needs a remote server where PHP mail() function works. It does not work in localhost. Open login.php file and find the login button. Look for a line that looks like the following code. Once you found it, place the following code under it. The login page will have the "Forgot password?" link after doing the code in the previous section. This is the page where the user lands when he clicked the "Forgot password?" link on the login page. Create forgot_password.php file in your project's main directory. Place the following code. 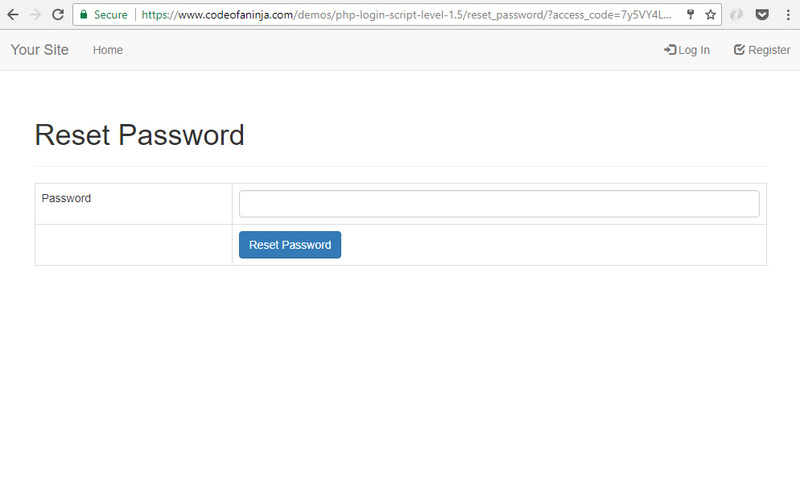 After doing the code above, run forget_password.php on your browser. You will see the following output. Once the user entered his email address and submitted the form, this code will be executed. Replace "// post code will be here" with the following code. Click that link to reset your password. Here's a sample email sent after the user submitted his email address in using the "forgot password" form. 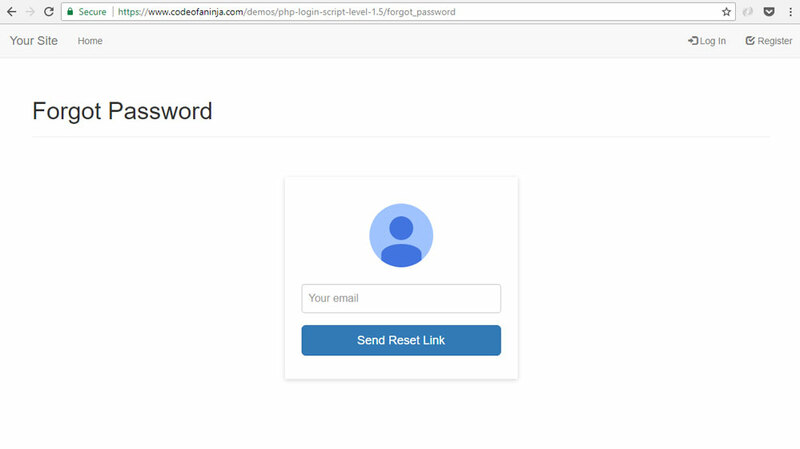 The "reset password" form is shown when the user clicked the link sent by the system after the "forgot password" request. If the use clicks the link on the email our system sent, he will land to this page where he will change his password. Create reset_password.php file. Place the following code. We need to check the access code to verify if the request came from the email generated by our system. Replace the comment "// check acess code will be here" of the previous section with the following code. This method will check the database if an access code already exists. It will return true if it found something, else, it will return false. Open “objects/user.php” file. Add the following code inside the class. If the access code exists, the page will render a form where the user can enter his new password. Once the user submitted a new password, the database will be updated with this new password data. Replace the comment "// reset password form will be here" of the previous section with the following code. Replace the comment "// post code will be here" of the previous section with the following code. This method will help update the password in the database. The previous section won't work without this method in the User class. Open "objects/user.php" file. Add the following code inside the class. 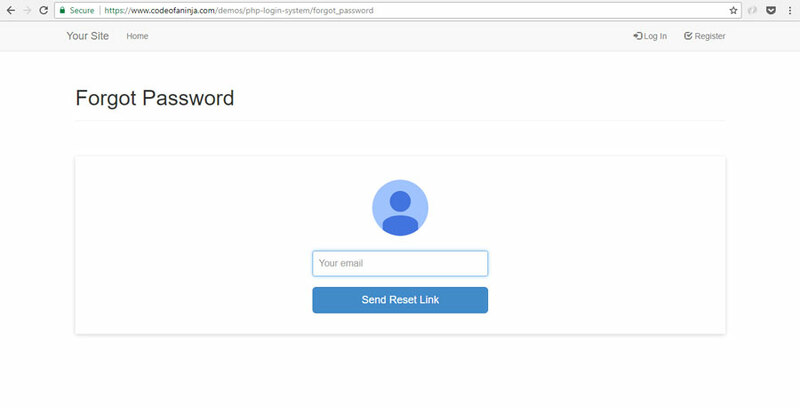 To run reset_password.php file, click the link sent to your email address via "forgot password" form. Once you downloaded the source codes, here’s how you can run it. I assume you work in localhost with your XAMPP server running. If not, learn from our tutorial here. Extract the ZIP file in your htdocs directory. You should have "php-login-script-level-1" folder with the files there. 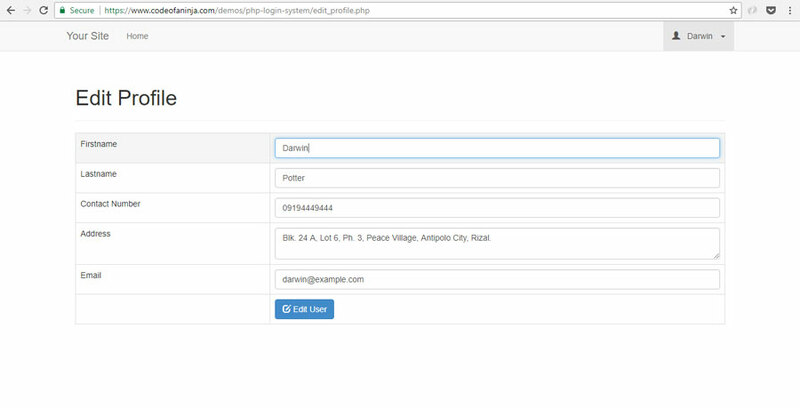 In your PhpMyAdmin, create a database "php_login_system"
Open a new browser tab, paste this URL http://localhost/php-login-script-level-1/login and see the magic. Try to login using the following credentials. This system works with PHP 5.5 or greater. Rewrite module is usually enabled by default. If not, it must be enable in your apache server. This source code is also called "PHP Login System Module" and this source code has more features than our LEVEL 1 source code above. See the details below. 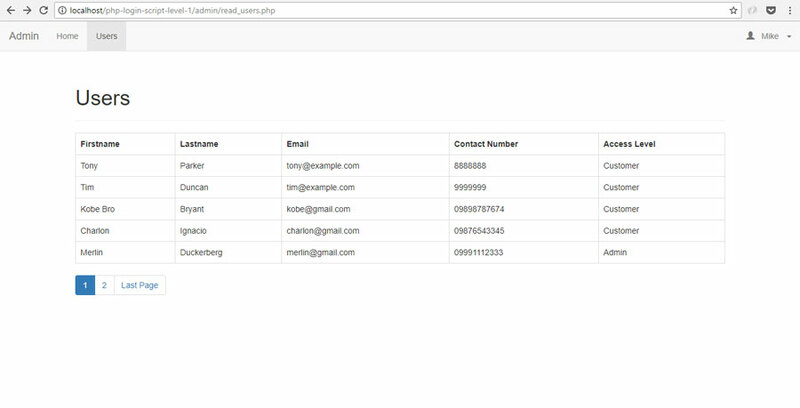 Enjoy our next tutorial: PHP Shopping Cart Tutorial – Step By Step Guide! Why? 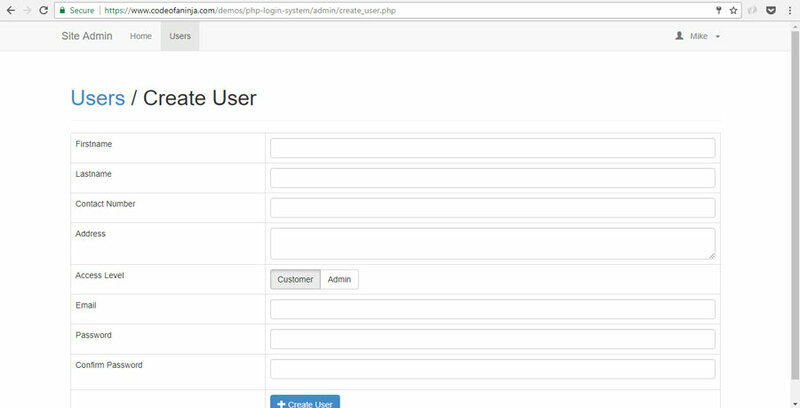 You can integrate our PHP login script later to that shopping cart app! 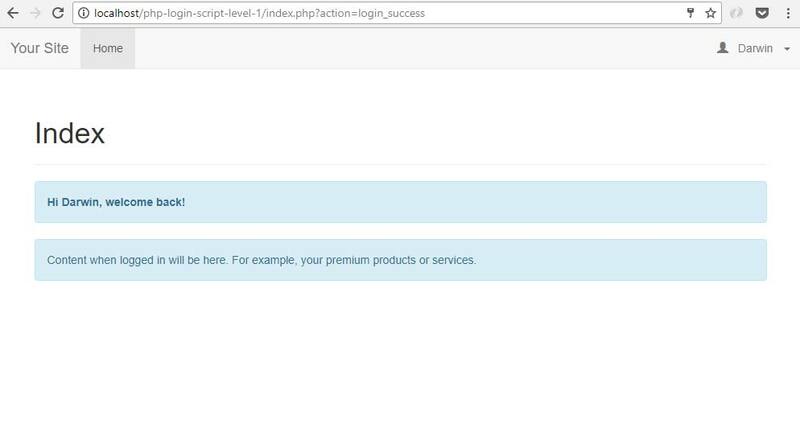 Thank you for reading our tutorial about PHP login script with session! Also, if you know anyone who needs to learn about this topic, pass along this tutorial! You'll be helping them out and me too. 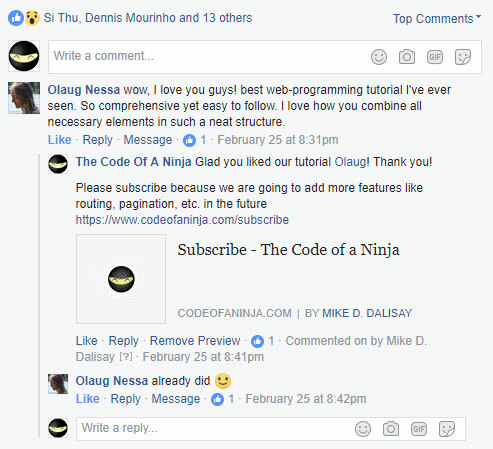 https://www.codeofaninja.com/wp-content/uploads/2013/03/php-login-script-1.jpg 419 800 Mike Dalisay https://www.codeofaninja.com/wp-content/uploads/2019/03/codeofaninja-with-text-3-1030x206.png Mike Dalisay2013-03-08 01:16:002019-04-10 21:03:34PHP Login Script with Session Tutorial - Step by Step Guide! I’d suggest that rather than just having a comment saying “password should be encrypted” you describe this process and show how to validate the password (I’d hope you mean “salt and hash the password” not really “encrypt). I could see a lot of people hard-coding the username and password into the script just copy and pasting your example and that’s teaching a very bad practice. Another option is just hashing the password with a salt and writing it to a text file – it’s not ideal, but it’s simpler than a database. If you’re looking for a good tool for password hashing, check out this project: https://github.com/ircmaxell/password_compat (or, if you’re on PHP 5.5+ you can just use the password_hash() function natively). Thanks for pointing that out, I agree with you, but I have a different perspective. If people are really going to create a production-ready login code, no doubt they will search and find out about what I said “password should be encrypted”. 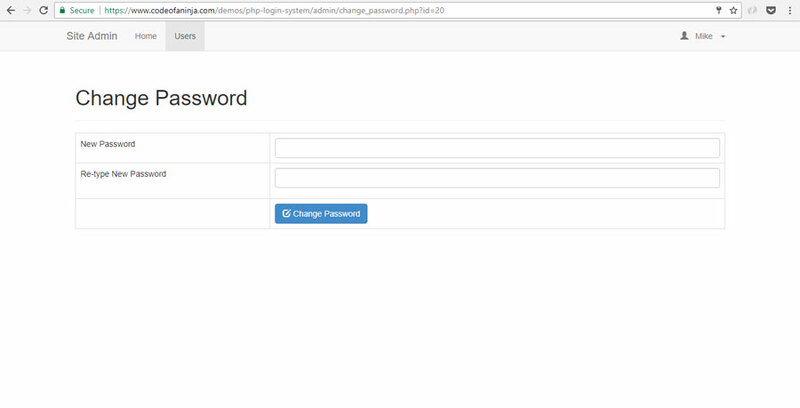 My goal in this post is to show people the simplest way to understand how a PHP login script usually works and give them a small start. Thanks again for your contribution to this post! I updated the post a bit. I downloaded the code and tried to run it on a WAMP server. 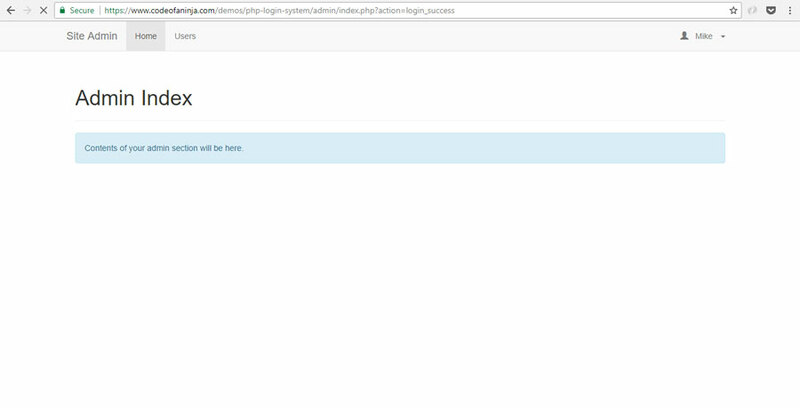 When I do, and go to login.php I get an error that ‘loged_in’ is an undefined index. Same with ‘action’ when looking in the $_GET array. Is there something I’m missing? I’m new to PHP and web development and appreciate the posts here very much. I tried running this code on a WAMP server so that I could experiment with it myself. When I did I got errors saying that ‘logged_in’ and ‘action’ array indexes didn’t exist. Am I missing something that would have created those in the appropriate arrays? and then use the $logged_in variable for the if statement. and then uncheck either expose php, track errors, or display errors. i forgot which is which. please let us know if you tried. Thanks, and sorry for the double post. I did find that your code does function fine and the errors are invisible to the user when display errors is turned off in the WAMP server. I will try your first option to check/initialize the session variables and see if that takes care of the problem. Thanks a lot,the tutorials are just wonderful. Learned alot from them. Hey @Dan, thanks for the kind words! You’re welcome! please where is the logout file ?? Hi @imsformation:disqus, the logout file is in section 7.11 above. Thanks for letting me know that it’s missing! Make “add to cart” button work???? You have to place that code inside layout_foot.php file. I updated that section as well. Thanks. Hi @julianlibor:disqus, you’re welcome! Thanks for the catch as well, I just added section “11.10 Add updateStatusByAccessCode() method” above. Thanks again @julianlibor:disqus, I just added section “12.6 Add updateAccessCode() method” above. From all the tutorials your is the best. thanks a lot . just awesome man. loved it. You’re welcome @that_s_enam:disqus! I’m glad to know you loved our work! Hi Mike, I want to congratulate you for your work, I really enjoyed it, but I could not get any link any item “8.6 User object create () method” a $ this-> function showError ($ stmt); you can post to me, thanks. Hi @disqus_0kiwAkh3lj:disqus, thanks for the kind words! Would you provide a screenshot of the error message? Sorry, I was not clear, I have not found a function $ this-> function showError ($ stmt) “in source code 8.6 User object create () method”, I’m still a beginner :). I wanted to know if you have her description. Hi @disqus_0kiwAkh3lj:disqus, thanks for pointing this out, I added the showError() method’s code on section 8.7 above. Hi @disqus_yWhVHNJCiR:disqus, thanks for your comment, I added the showError() method’s code on section 8.7 above. Let me know if that worked for you. Yes, no doubt this script is wonderful, thanks for sharing it. Hi @disqus_v10UkPONq8:disqus, I’m unable to replicate the issue, it works on my end. Are you sure the access code is being saved on your database? 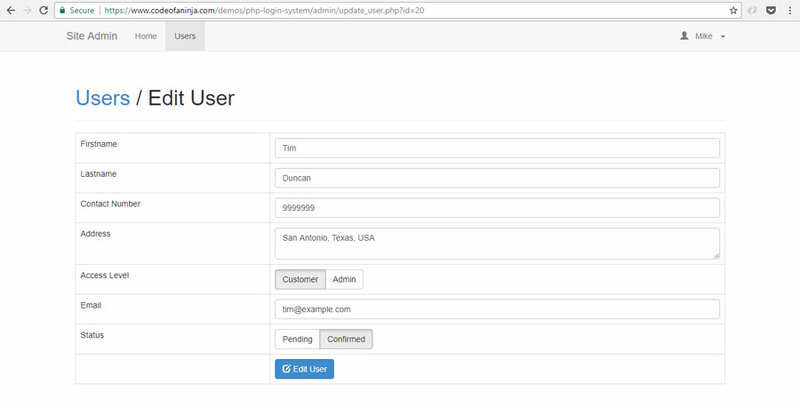 Please check your PhpMyAdmin. Hi @disqus_qVmqkTIGsc:disqus, make sure your ID field in the users table has a primary key and auto-increment property. Hi Mike, First, I would like to thank you for this great tutorial, I learned a lot since I’m from the old programming generation. The way you explain this work help people understand what is going on in each step. I did the whole coding including sections 12 & 13. There is only one thing I want to share with you about point (12.1 Add forgot password link), the following code kept giving me error till I added “echo” for each line of code. Hi @disqus_qVmqkTIGsc:disqus, the email feature won’t work on localhost. You need a paid remote server to make it work. I suggest Bluehost. Hi @zaem_shakkir:disqus, make sure your CSS file is linked properly in the head section of your page. Hi @zaem_shakkir:disqus, would you show us a screenshot of the issue? Which error message did you encounter? Would you describe in detail what exactly is the issue on your page? Hi @zaem_shakkir:disqus, thanks for the kind words! Make sure the page it redirects to is working so it won’t be blank. Really clear and easy to follow ! Hi @nathanfrancoeursavoie:disqus, thanks for the kind words and tips! I’m sure this is useful for people who encountered the same issue. HI @zaem_shakkir:disqus, I’m unable to replicate the issue, but if you can see the link, you can copy and paste it on a new tab on your browser. Hi @zaem_shakkir:disqus, which web hosting provider do you use? I suggest using a different email server when sending email. I recommend sendgrid.com or postmarkapp.com so that it won’t go to spam folder. 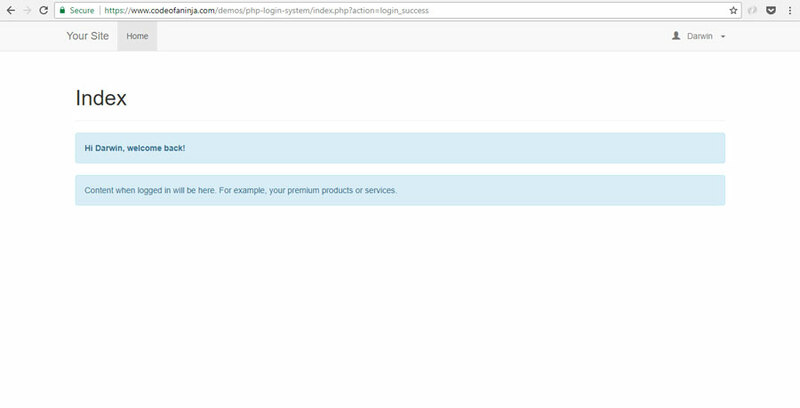 Hi @Var1984:disqus, are you sure your database name is “php_login_system”? I double and tripled checked it and it is named correctly, What I am wondering is if it may be a port issue, I had to switch the port to 8080 for Apache due to conflicts on port 80? I’m not sure about your local server settings. How about your database username and password? If you have a remote server, I suggest testing it there as well. Thanks for the help Mike, I actually went back through the database and realize are had wrong settings on it. Once I rebuilt the database it started working, thanks..
Hi @muhamadfahrizanovriansyah:disqus, it looks like your objects/user.php file does not exist or it is in the wrong folder. Please make sure it is in the correct directory. Hi @mac, please add the emailExists() method as instructed in section 7.8. Try to add it before the last closing curly brace. Hi @dennisandrian:disqus, would you tell us the error message you see on your console? Another solution is to remove the logout button from your drop down and put it in the navigation bar. Great! I’m glad it works for you now.